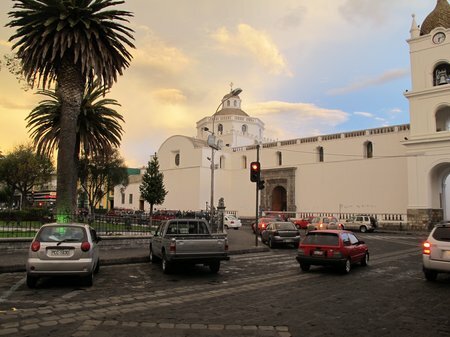 We spent two short days in Quito before catching the bus south to Cotopaxi National Park. We could have spent longer in Quito but when planning our trip I thought that getting out of the city and doing a little hiking would be a good way for all of us to shake off the effects from traveling. Our bus from Quito dropped us at the side of the road opposite the entrance to the park. It was alarming to have to run across the extremely busy Panamerica Sur at dusk with backpacks to get to our little hotel, but the peace and quiet was a very welcome change from the noise of the city. The next morning we asked about transport into the park proper. 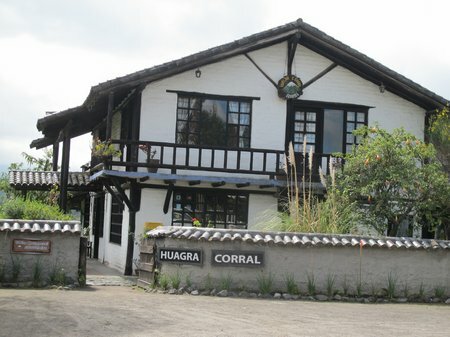 Our hosts quoted $70 for a guided tour up to the climber’s refuge at 4100m with a stop at the park museum and lunch included. 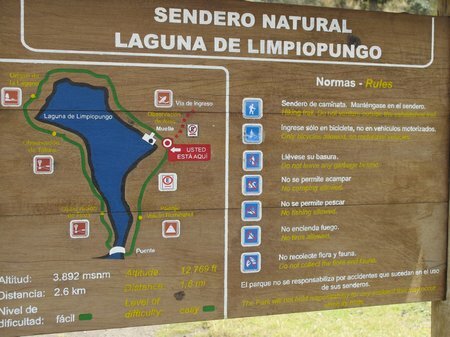 At half of our daily budget, this seemed excessive – not to mention that the guided tour allowed for only a short (2k) walk around Laguna Limpio Pungo, which defeated the whole purpose of our trip to Cotopaxi. Murph set off to find a better price from the drivers clustered at the junction with the main road. For $15 he found someone willing to take us up to the lake (3100m) only. I think both the driver and our hotel hosts thought we were a little crazy to plan to walk down the mountain. Since we weren’t planning to go up to the snow-line and the path was mostly downhill, I was surprised that this wasn’t a typical visitor activity. There are some pretty precarious bends in the dirt road through the park. On one of these I noticed that our driver was only using one arm – his left – to change gears. His right sleeve hung empty next to the gear-stick. No wonder the truck was lurching on the turns and inclines. After walking around the lake, a pleasant but unremarkable walk, we headed down the mountain. (For the record, I’m sure that on a sunny day when the volcano peaks ringing this valley are visible, this is a stunning walk. We just weren’t so lucky). The first third of the hike was steeply downhill and luckily, there was a narrow path in the grasses above the road. We passed a soccer team training (the national team according to the one-armed driver) and made it to the park museum pretty quickly. The rest of the walk was much less pleasant since we had to walk on the road and eat mouthfuls of dust every time a vehicle passed. CAM and I agreed that the Ministerio de Ambiente would do well to add some distance markers to the road and, if they could find the funds, building a hiker’s path would encourage more people like us (and not the crazy French and German climbers we met who were planning to summit the mountain) to come visit Cotopaxi. You’d think that a ten mile walk at altitude would be enough for one day – our kids certainly did – but we had other ideas. With buses passing by the park entrance every 15 minutes or so, it seemed only natural to hop on one and check out Latacunga (the nearest town) for dinner. One more dash across the highway between speeding traffic and for the princely sum of $4 we were on our way south. All we needed to do was to remember where the bus dropped us off in the town and we could return there after eating to catch a northbound bus back to the park. Or so we thought. I was standing in the aisle, BigB in front of me, a little too early for our drop-off, when an older lady two seats in front starting pointing at BigB and waving at me in a very alarming fashion. The poor kid was going green and was struggling to hold in his stomach contents. Uh-oh. The lady moved over to the (thankfully empty) window seat and I reached into my bag for something to hold the impending effluence. I called out to Murph while holding the only thing I could find – a baseball cap – under BigB’s nose. And so we found ourselves standing on the side of the street with a kid throwing up, without a map, hoping that we were within walking distance of our intended destination. As if we hadn’t had enough walking earlier in the day, once BigB was feeling a little better, we started walking in the general direction of where we thought the bus had been heading. Even though it had been a long time since the empanadas we’d bought from the roadside stand inside Cotopaxi park for lunch, I wasn’t thinking about food. We had to find our way back onto our little tourist map before dark to have any hope of getting back to our hotel. We garnered plenty of curious stares from the locals in this impoverished neighborhood as we walked by. Clearly we were a very unusual sight – but not so unusual that one little lady didn’t try to entice us to the chicken she was cooking on the roadside or that a giggling group of teenagers didn’t pass on the opportunity to practice their English by calling out “Hello” as we passed. Eventually I recognized a street name and we finally made our way to downtown Latacunga – at rush-hour. Rush-hour in this market town was very different from anything I’d ever seen. There was a sea of people on the sidewalks and the markets were thronged with people buying and selling. It seemed as if every second store was a salon where hairdressers were industriously and furiously chopping locks – with nary a sweeping brush in sight. Police were directing traffic and hawkers, tiny women mostly in native dress, clogged up sidewalks and intersections both with their wares and with the bevy of children around them. The babies, strapped to the womens backs in all manner of shawls and wraps, were at least out of the way. Tummies leading the way, we headed for a pizzeria on the town square which seemed an oasis of calm after the pandemonium down by the market. An hour or so later as we headed back across the bridge to the “bus terminal” (i.e. 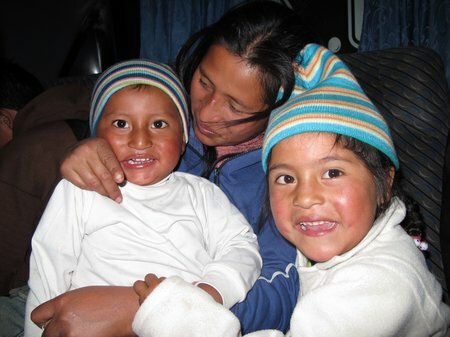 a junction where buses pick up and drop off), I found myself shooing my boys like a mother hen while watching a young Andean mother balance her shopping bags as she shepherded two tiny kids along beside her. The younger, a little boy, was refusing to hold his sister’s hand. His little temper dance was a pantomime. As we passed, her eye, raised in frustration, caught mine, and we shared a smile. Our bus, was just about to pull away when that same mother climbed aboard and ended up sitting right by us. She struggled to keep the little boy amused with an empty plastic bottle but he was having none of it and kept staring at me. I reached into my bag, pulled out a hand-full of dried cherries and pineapple and gingerly offered them. He smiled shyly at first but once he tasted the treats I’d given him, his independent nature rallied as he pushed out his hand with a mischievous smile. Both his mother and I had to encourage him to share with his sister. In my pidgin Spanish I tried to assure the mom that I was sharing frutas, but I think she was having as much fun watching us play with her kids as we were having doing do and didn’t seem at all worried about what I was actually feeding her child. This time we were dropped on the right side of the highway so we didn’t need to risk our lives running across it in the dark. Once in our room, CAM dashed to the bathroom. Apparently we hadn’t been near a toilet which met his usability requirements all day. The result? Murph had to manually unblock the loo. What a finish to a long, busy day. This entry was posted in Ecuador, International Escapades and tagged Cotopaxi, Cotopaxi National Park, Ecuador, Latacunga on September 6, 2010 by wandermom. That’s an exciting start to your trip. Thanks for the laugh though I needed it;) Hope everyone is feeling a bit better now. It would be useful if you had a button to tweet this page at the bottom of each post, such as http://www.addthis.com/ offers. Many requests I get for tweets don’t make it easy to tweet or otherwise recommend their pieces to the many social media sites, and time is of the essence in my case (so that I can travel more, as I did most of my life). What an adventure day for you! Happened upon your posts on twitter, I think and have been reading them all morning. Very interesting and amusing. And brave. Do you speak Spanish or any other languages? And how would you get money to travel for a whole year? Must’ve took an awful lot of planning. !